Analyst: "We are in a free media, free news, free information environment"
LONDON, England (CNN) -- Are Web users ready to start paying for content? 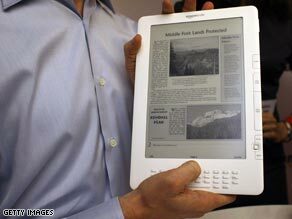 Amazon's new Kindle will offer several U.S. newspapers to subscribers. Not according to an entirely unscientific straw poll of hundreds of CNN.com readers who sounded off about News Corp. tycoon Rupert Murdoch's plans, announced this week, to start charging for access to his newspaper's Web sites. Murdoch said the success of the Wall Street Journal, which charges for premium material and services, had proved that paid-for content could be made to work and said the current free access business model favored by most content providers was "malfunctioning." But CNN.com users, on the whole, disagreed. "As long as there is internet, there will be free content. And as long as there is free content, sites trying to grow on a paid-content business model are not going to survive. It is as simple as that," said Syeed Ali. Ken Woods said Web site revenues should be generated through advertising while JD predicted the demise of traditional media: "Newspaper industry should just die and journalism should be democratized. We have blogs, forums, news aggregators... why should I pay for content that someone else can write just as well if not better than the biased reporter/editors at some giant media conglomerate?" Some users, however, took the opposite view. "I would gladly pay for the service that reporters provide to me!" wrote Chazoo. "I know it costs money to investigate and report the news and I don't want the news to be controlled by advertisers." But industry analysts say Murdoch's efforts to pitch a business newspaper such as the Wall Street Journal as a model for paid-for content is flawed. "The Wall Street Journal and the Financial Times are specific to a rich elite who need the information to make real time decisions on investing and making money," Roy Greenslade, Professor of Journalism at London's City University, told CNN. "Erecting pay walls on general news sites would be counterproductive. We are in a free media, free news, free information environment." With newspaper circulations falling as readers go online or to mobile multimedia devices for their headlines, and advertising revenues suffering badly from the financial crisis, Murdoch is not alone in seeking new ways of generating income from the electronic content. Currently none of the three leading providers of online news, Yahoo! News, the New York Times Digital Edition and CNN.com, charge for Web content. But this week three of the United States' leading papers, the New York Times, the Washington Post and the Boston Globe, announced they would make their newspaper editions available to subscribers on the latest version of Amazon's Kindle e-reader. Addressing delegates at this week's World Magazine Congress in London, Carolyn McCall, the Chief Executive of the UK-based Guardian Media Group, said it was "crazy" that expensively produced content was given away for free -- but admitted it was virtually impossible to charge users in the present circumstances. "There will be some parts of your website... lots of specialist areas where we do brilliantly, where we should think about how we charge for content that is not easy to replicate," McCall said. GMG Director of Communications Chris Wade told CNN that the company was not reviewing its online strategy. "We have no plans to charge for content," he said. Greenslade said efforts to impose charges for content would be particularly difficult in the UK -- where News Corp. titles include the Sun, the country's bestselling daily newspaper, and the Times -- because the BBC's extensive Web site is publicly funded via a television licence fee. He said he expected News Corp. titles to begin by charging for bits of content -- "but that will merely annoy users who will go elsewhere," he added. Other experts believe that a tiered system of access to content could be made to work. Joshua Benton of Harvard University's Nieman Journalism Lab told CNN that "putting a lock and chain" on the home page was not an option for most Web sites but that online publishers needed to find a way of generating revenues from a "small slice" of users willing to pay for content. "It is a matter of figuring out which products you can charge money for," Benton said. "You probably need a platform change, so on mobile devices people are used to paying for content," Glocer said. "I pay for content on my Kindle and I think electronic ink may breathe a second life into what we know as the newspaper business, but is really just a content business." Greenslade said Murdoch was right that a debate was needed on how journalism in the future is funded -- and admitted that the industry would have to get used to working within tighter financial margins and with a smaller, more flexible workforce more directly responsive to its audience. "We have to look to a future of smaller journalistic staff and greater user participation," he said.